Commitment; a Lifecircle for contemporary interiors. Everything we do at Offecct is dedicated to our mission of creating sustainable meetings and sustainable life cycle for furniture, in collaboration with our clients. It’s our conviction that original design, genuine quality and individualized solutions prolong the life cycle of our products. Nothing comes from nothing. This means that we should be grateful for the resources provided by our planet, but also that we must be prepared to give back. Because those resources are not infinite. We therefore do our best to minimize our impact on the environment. We aim to use as few of the Earth’s resources as possible in our production, and also to take care of the products we have made through circular recycling. For us it’s about respect for the world around us, and for future generations. 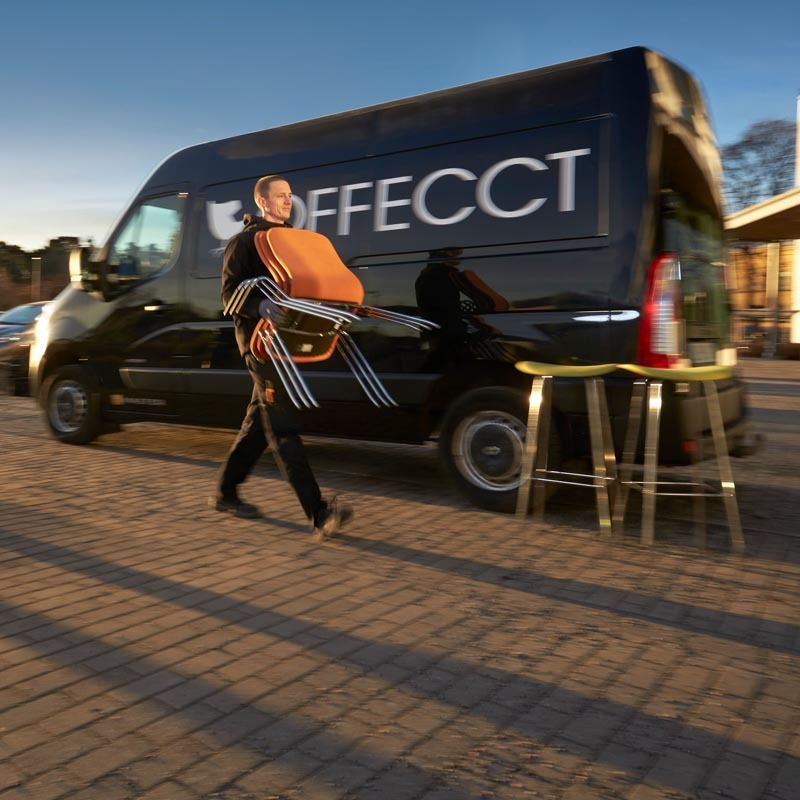 The symbol above demonstrates our business model in four main areas, explaining Offecct services and solutions, adjusted to our customers needs. Our Offecct Lifecircle philosophy is based on the desire to create a sustainable life cycle for all our furniture. This means that we assume full responsibility for every part and every aspect of our way of working – before, during and after the sale of our products. 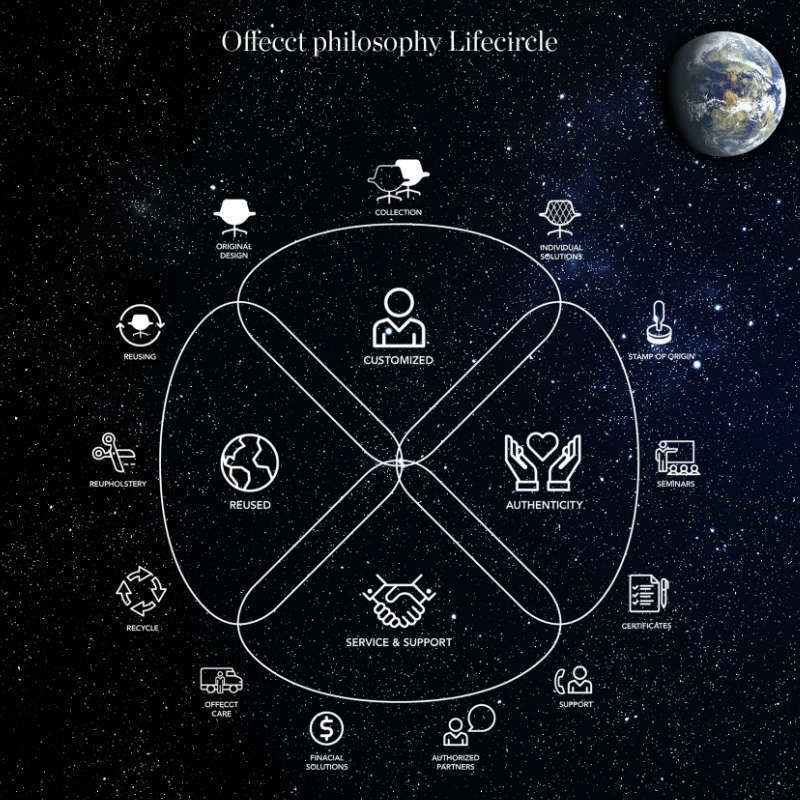 Our Offecct Lifecircle philosophy demonstrates our business model in four main areas, each offering options to create an optimal meeting environment while contributing to a more sustainable society. We offer services and solutions connected to our products and to us as a business partner. From a sustainability perspective, complete control of our own production process in terms of choice of materials, production technology, transportation and all other CSR matters is a crucial part of this philosophy. In collaboration with our design team, our collection is designed with the aim of flexibility with a long term perspective. We develop our range and our furnishings in accordance with the market’s preferences, requirements and future needs. Thanks to our original design, our authentic quality collection and the possibillity to design unique individual solutions combine to prolong our products’ life cycle, making them sustainable in the long term. Good design lasts for generations. Original design, Customized product collection, Individual solutions, Adaptions, Offecct Selected patterns and Quality Warranty. Guarantees for genuine original quality. By our stamp of origin we offer our clients full access to information of the specific product. Our furniture is designed by selected designers from around the world, and by our own skilled craftsmen and women in Tibro. Stamp of origin, QR codes and certifications linked to the products can be accessed throughout the entire life cycle, and our production process is transparent. We can guarantee the whole chain from design to delivery as we control our own production and distribution. Our commitment to authenticity includes our staff, our partners and our clients. Stamp of origin (QR codes), Education and Seminars, Eco certificates. Kali chair by Jasper Morrison. A unique sustainable project in collaboration with Econef children centre, Tanzania, Africa. We have created a second hand market for our products that compliments Offecct Lifecyrcle philosophy. Offecct Reused program includes reupholsery and cleaning of our clients Offecct products. 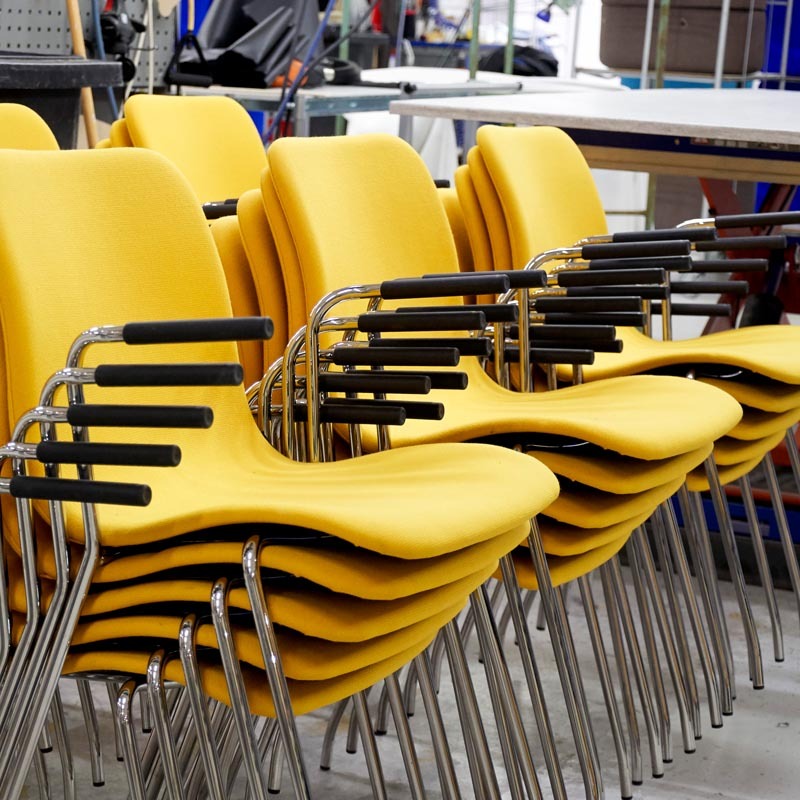 Here Cornflake chair by Claesson Koivisto Rune, getting a total makeover. To think circular recycling and upcycling is an essential part of our businessmodel and what we see as our responsibility; to give our new and existing clients the opportunity to renew and exchange their interior products. We develop our products so that they can be reused, and we offer services for an active second-hand market. The life cycle perspective ensures financial and environmental sustainability, and makes it easier for our customers to replace and renew their furnishings. Reused outlet online, Reupholstery and cleaning services, Recycling of materials. We claim full responsibility for our products before, during and after purchase. Our products are designed for a long lasting life. 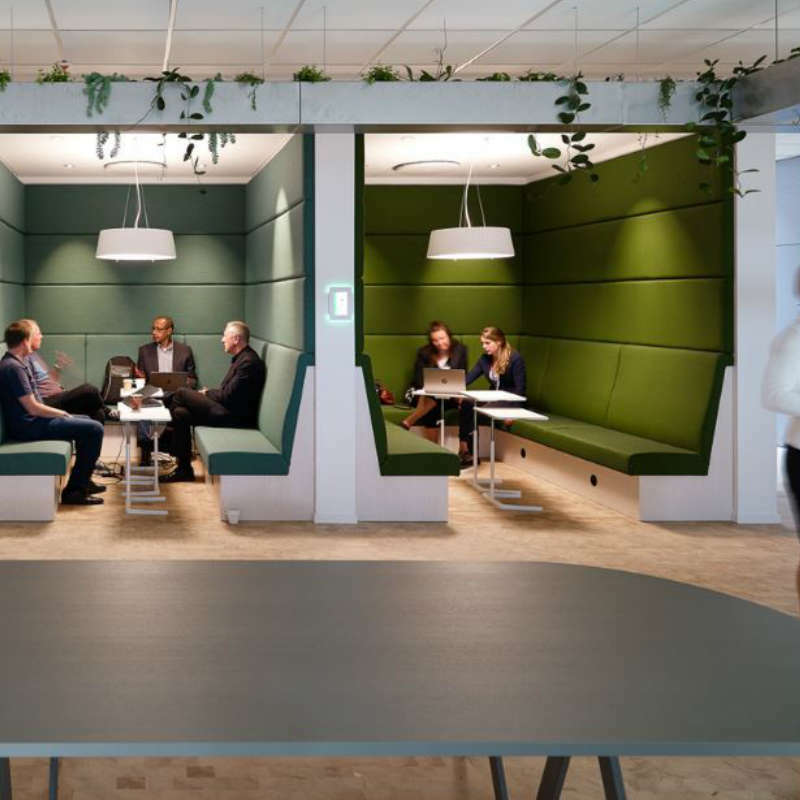 We see furniture and interiors for professional environments as long‐term investments that should be sustainable over time – environmentally, economicaly and socially. We also want to be available after delivery. We consider furniture and furnishings as a long-term collaboration, and are happy to assist our customers in maintaining, overhauling and looking after the products they buy from us. This is our way of guaranteeing sustainable furnishing solutions. Good for our customers, and for our planet. We claim full responsibility for our products; before, during and after purchase. We are always personally involved in our deliveries.